Change often comes quickly to Manhattan neighborhoods. In 1881 No. 381 Fifth Avenue was home to the wealthy and respected C. Oliver Iselin and his new wife, the former Frances Margaretta Garner. The couple had been married in the house, owned by the bride’s widowed mother, just a year earlier. The wedding had been attended by 500 of some of Manhattan’s wealthiest citizens—including Caroline Schermerhorn Astor who lived a block to the south. But ten years later the Iselin family was gone, their mansion being used by Madame Leoncia Tierce as her millinery shop. By 1897 the art galleries of Julius Oehme would share the building. And soon after the widowed Elizabeth J. Fales died in her house next door on October 1, 1900, it was taken over by the Musical Art Society. The blocks of Fifth Avenue just above 34th Street had been taken over by every mansion district’s greatest enemy—commerce. By 1907 once-grand homes in the neighborhood had been razed for modern structures—the Astor mansions had been replaced by the Waldorf-Astoria Hotel; Benjamin Altman’s block-consuming department store now stood on the east side of the avenue between 34th and 35th Streets; and real estate operator J. H. Peller leased the old mansion at No. 381 from the Iselin estate as the site of a new commercial building. On October 27 The New York Times reported that Peller had commissioned architect Samuel Sass to transform the house into a six-story brick and limestone-fronted building to cost $60,000. Rapid-fire construction resulted in its completion within the year. Five stories of Beaux-Arts decorated limestone sat above a store front seemingly plucked from the Champs Elysees. The rusticated façade served as a framework for the four-story cast iron bays; adorned with a lush carved cartouche and palm fronds. A free-standing Ionic colonnade fronted the sixth floor below a bracketed copper cornice. No. 381 quickly filled with tenants. William Bentley Quaintance took the store, basement and second floor. The wealthy merchant's upscale shop sold imported “madras and muslin piece goods and fancy nets.” His patrons were the dressmakers of Fifth Avenue who catered to the socialites who had lived in the neighborhood only a few years earlier. One of those was Miss Alice Maynard, a well-known society dressmaker, who also moved into No. 381. 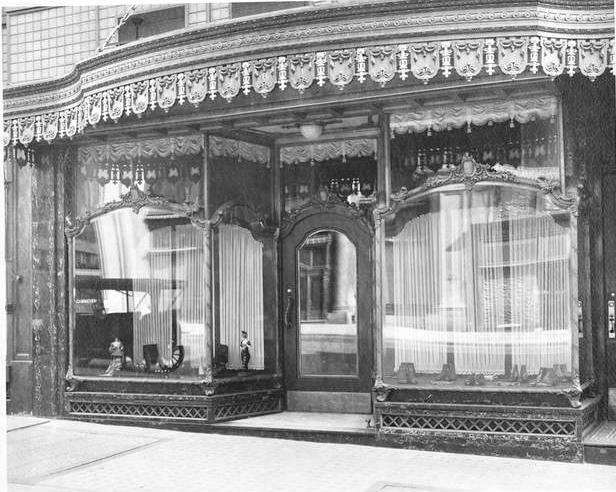 A. J. O’Donovan & Co., importers of laces took the entire fourth floor upon the building’s opening. Society women were stunned by a tragic accident that occurred on New Year’s Eve 1909. Mrs. Florence T. Ellis was celebrating at the exclusive Café Martin when, as reported in The Times, “a tiny flame touched the flimsy fabric of her skirt.” In an instant Mrs. Ellis’s gown was ablaze. Horrified patrons watched while everything was done to extinguish the flames. Yet Florence T. Ellis died of her injuries. Three months later plans were filed. “The smaller building will be increased in height to that of the larger, and a pent house for studios built on the roof,” reported The Times. The alterations to No. 383 would cost Peller about $40,000 and would result in a mirror-image of No. 381. Tenants of No. 381 stayed on through the construction. 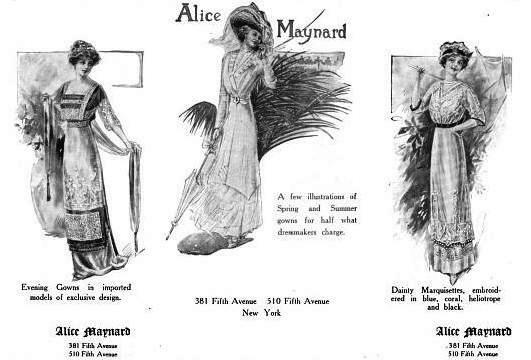 In April 1911 a journalist from Theatre Magazine stopped by Alice Maynard’s shop. “Always there is something new to be found in this delightfully cosy shop, in which the gowns are distinguished by unusual elegance and refinement that appeals so strongly to the discriminating class of women,” she wrote. As construction neared completion on No. 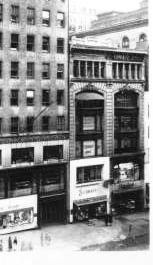 383 Fifth Avenue in January 1912 Peller had Samuel Sass made $1,000 in alterations to No. 381 as well. Skylights were added to the top floor and walls, presumably on that floor, were reconfigured. That same year, on July 1, the store space in No. 381 was taken by Cammeyer Shoes. Since 1892 Alfred Cammeyer’s business—touted as the largest shoe store in the world—was located on Sixth Avenue along the shopping district that would become known as the Ladies’ Mile. 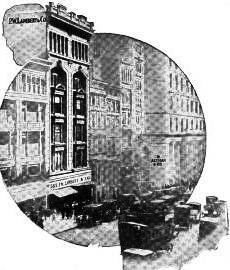 Cammeyer died in 1909, at the time when the great New York retailers were moving northward. The removal of Cammeyer to No. 381 Fifth Avenue was one of the final dominoes to fall in the death of the Ladies’ Mile. In the matching retail space next door was Schrafft’s drugstore. It was the scene of an unfortunate accident on November 20, 1915 when Marie Ethel Barker dropped in to pick up a bottle of Zoolak. Marie worked in the office of Dr. Redell at the corner of 35th Street and Fifth Avenue. At around 2:00 that afternoon he sent her to the drugstore to pick up the medicine. As she entered the store, she casually noticed that the iron sidewalk shutters to the basement were closed. Her errand took about ten minutes, during which time a Schrafft's employee went into the basement. Marie Barker was looking at the crowd of pedestrians on the sidewalk rather than where she was walking and she dropped down the open trap door. She somehow grabbed the open door and clung there until a boy helped her to the sidewalk. A year later the management of Schrafft’s drugstore found itself in court defending against a law suit filed by Marie Barker. Both Schrafft’s and Cammeyer would remain in the stores for years. Meanwhile a variety of tenants came and went in the upper floors. In 1917 general contractors Cauldwell-Wingate Company was here. That year it received the contract for constructing the Henry Miller’sTheatre on West 43rd Street. In 1920 merchant tailor Jules C. Weiss & Co. was in No. 381; and the National Better Business Bureau had its offices in No. 383 by 1927. In 1929 Max Fertig, a linen dealer, leased the entire building at No. 381. 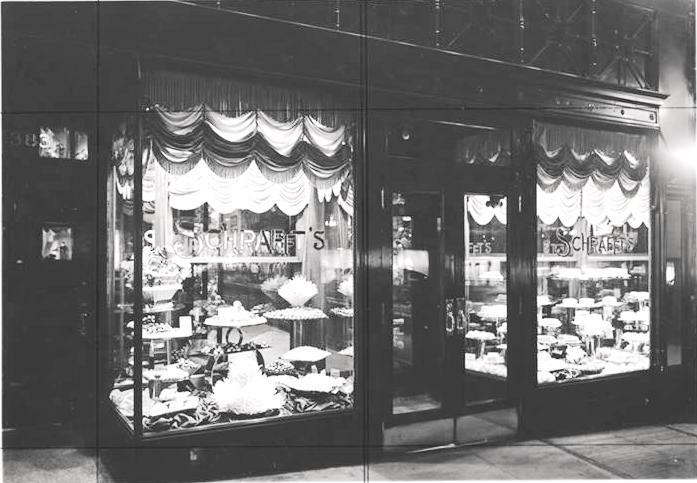 On August 10, 1940 Gerald Shattuck, president of the Frank G. Shattuck Company, owners of the Schrafft’s chain, announced that the firm had hired the architectural firm of Bloch & Hesse to redesign the storefront and modernize the interior of No. 383. The result was a flat modern façade in keeping with the times and in brutal contrast with the structure. Throughout the rest of the century the wide range of shops and offices continued. A Bornand, Inc. music box dealers and repairers was in No. 383 in the 1940s; Ritts Company’s Fifth Avenue Tropical Shop sold contemporary “tropical” furniture of rattan from No. 381 at the same time and into the 1950s; and the Japan Trade Center was also in the building at mid-century. It was not until 1959 that the Fales Estate finally sold No. 383. By 1960 the Fifth Avenue neighborhood was slightly tarnished. Joseph Menaged owned his McCall’s Fifth Avenue gift shop at No. 381 Fifth Avenue that year. In February he received a special sale license for his Going Out of Business Sale. A sign in the window read “Everything Must Go.” A representative of the Better Business Bureau, Claire Frey, stopped in. Joseph Menaged showed her Oriental rugs. When the special license expired at the beginning of March, she dropped in again. McCall’s Fifth Avenue had changed its name. It was now Regis Fifth Avenue. But it was the same Mr. Menaged who waited on her and he showed her the same Oriental rugs. While the twin buildings appear to be one; Nos. 381 and 383 remain separate structures. A recent facade unifies the lower two floors where somewhat garish signage mocks the elegant Parisian storefronts of a century ago. The upper four floors, however are essentially intact since Samuel Sass remodeled two brownstone mansions into upscale commercial buildings.